****As of today Friday February 3rd, I only have the little brown and white female left, she is the shy one of the 3 that is the only reason she hasn't gone, she is very affectionate and needs to find her lifetime friend. Please TEXT 750- if you are seriously interested in her. 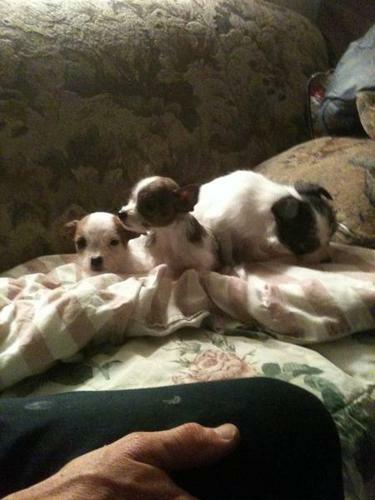 I have one male and two female jack russell x miniature poodles for sale. They are now 12 weeks old and guaranteed healthy and ready to go to their forever homes! They come with a health card showing their first shots as well as their regular de-worming schedule. They should all stay relatively small as the mom who is the short legged smooth coat Jack Russell is around 7 lbs - the dad who is brindle (black with some brown highlights) colored miniature poodle is a bit smaller at approx 5 lbs. They all have a fuzzy broken coat to them and should end up being non-shedding like the poodle. The littlest one in the pictures is the runt and she is a girl (she is brindle and white), the biggest black and white one is the boy and the other medium sized brown and white one is a girl. They all look very similar to the Frazier dog from the TV show! All 3 of them are really cute and affectionate, well socialized with people and other dogs and partially house trained. They will make wonderful small house dogs and life long companions. Please call to arrrange viewing of the pups, Altamont is approx 1.75 hours from the city but delivery to the west perimeter of Winnipeg (Oakbluff) can be arranged for an extra $25.00 fee. Or Delivery to Carman for free as I work there every day (Carman is about 1 hour west of the city). Please contact me asap as I think these little guys will go fast. You can call me at 750- and leave a message or TEXT me as I will respond immediately. I will also answer e-mails on a regular basis as I have an I-phone. I can also text more pictures if required, some of these were a little blurry. You won't be disappointed in these pups! They would make the perfect early valentine's gift for your loved one! Adorable young dog looking for a good home! !